When my wife plans a shopping trip she first makes a list of what she wants to buy. Then she decides which stores will give her the best price and/or selection for each item. Finally she decides when she is leaving on her shopping trip, the stores she will visit in order and always takes her cell phone to alert me if her plans change or she runs into a problem. She is very organized and her trips usually go without a hitch. Can you say the same thing about your modular home business? I seriously doubt it. Without careful planning which begins with what is happening in our business right now, where you want it to be, alternative plans in case something goes bump in the night and alternative actions…you will end up on a road to failure. Oh sure, you’ve been doing this so long that you’ve probably seen just about all the problems facing a modular home builder at least once. Does that make you smarter than your competitors? No! Experience helps but unless you have a plan of action for the next time one of those unexpected bumps occur, you will be forced to repeat it with all the problems you encountered the first time. 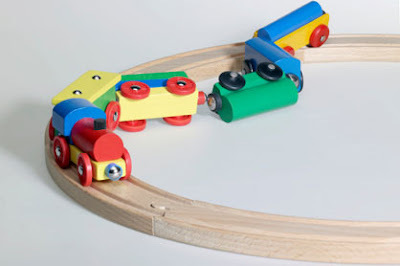 A Good Business Plan helps keep your train on the track. Start by writing out what you do. Why does it matter to you and your business? Now take a hard look at what you wrote down and question yourself if this is still what you want you want to do. If you could start over, would any of the things on your list be eliminated? Make a list of your core business values. Choose 3-5 values that embody both your belief system and ultimately your brand. These values will be used to make sure marketing messages, team members, joint venture partners and opportunities are aligned with your brand. Outline your products and/or services. How will you generate revenue and how many of each product or service do you need to sell in order to reach your financial goals? This is where you put on paper what your profit has to be, what your expense limits are and what your marketing efforts will entail. Do some market research to explore your ideal clients and their buying behavior. Who are your competitors? What is their brand story and how is it different than yours? What do they charge? Where do they market to their audience? How do they interact with their audience on social media? Do they write guest blog posts? Are they using video to build their business? Are they REALLY making money? Have you ever met one of their clients? What edge do you have over your competitors? Design a marketing and sales plan that not only goes through the motions but tests, tracks and adjusts to get you the results you need. How do you plan to reach your audience? Email marketing? Facebook Ads? PPC ads? Direct Mail? Social media? Video? Blog? PR? How will you attract new home buyers to your website and ultimately get an appointment? Get your financial ducks in a row. Lay out how much it will cost you to market your business, hire a team as needed and grow your brand. Don’t forget to include incorporation fees and taxes as well as business insurance expenses as well as bookkeeping and accounting fees. The more organized you are about how much money is coming in and going out of your business, the easier it will be for you to keep track of your company’s growth and profits. Many business owners fail to focus on this piece of the business which is a huge mistake. Build a team of advisers, mentors and supporters who believe in your vision and will help you to stay on track. One such way is to meet regularly with other modular home builders such as a breakfast meeting. Whether this is a team of one or many, having advisers and mentors who share your values, mission and vision will help you to avoid the pitfalls, road blocks, diversions and pile ups that can happen in business as in under prepared road trips. Once your business plan is mapped out, make sure that your personal and family goals are included in the day to day operations of your business growth. Schedule time for exercise, socializing, meditation, creative time and anything else that will give you a well-rounded lifestyle. Business plans truly are a road map to the future, so plan yours out with every aspect of the lifestyle you dream of. Don’t be afraid to lay out every detail including deadlines and vacations. This is your life and your business, so make them the best they can be. If you don’t create the plan, you will simply drift through your life and have an experience much like a road trip without a map or a destination.